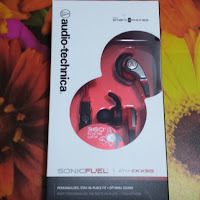 I tried the AudioTechnica Sonic Fuel with my smartphone. It's nice to be able to listen to music and easily switch to talking on the phone when a call comes in because of the inline microphone. Then when the call is over I can go right back to my jams. The headphones have good sound which is really important. Even more important is a good fit. There is nothing worse than having in-ear headphones that don't fit properly. If they don't fit right they can be uncomfortable, or worse, not even stay in, and then you definitely won't have good sound! What good is a pair of headphones that don't stay in your ear?! With these AudioTechnica Sonic Fuel headphones you don't have to worry about them falling out or being uncomfortable. Each one comes with 4 different size tips for inside your ear, and it also comes with 3 different sizes to adjust the fit around your ear. These unique eartips rotate a full 360° to automatically align with the angle of your ear canal, directing the sound towards your inner ear to avoid pressure and discomfort, while the c-tips fit the curvature of your ear for maximum stability. With the personalized fit, you can do just about anything and know that your headphones are staying with you, comfortably. Do you want to win a pair of AudioTechnica Sonic Fuel ATH-CKX5iS headphones? All you need to do to be entered to win is complete the easy entry form below. Disclosure: I received this product for free for review and the prize is being provided by the sponsor. This site uses affiliate links. All opinions expressed are my own.